Trust is a key ingredient in all of the commissioned work I accept. As in all my paintings, it is important to me to capture my model in a natural setting. When working with a model, I have found that I cannot force them into an unnatural or static pose. In this case, the painting lacks much of the life and vibrancy that I desire in my work. If you enjoy that same feeling and emotion in your commissioned piece then I would be delighted to work with you. During your initial inquiry, I will either meet with you in person or talk to you over the phone to gather your thoughts on your commissioned piece. We will discuss the subject, possible sizes, price (with or without a frame), timelines, etc. At this point, we will determine whether or not we can schedule a short painting session from life (subject model present) or just a photo shoot to gather images I can work from. 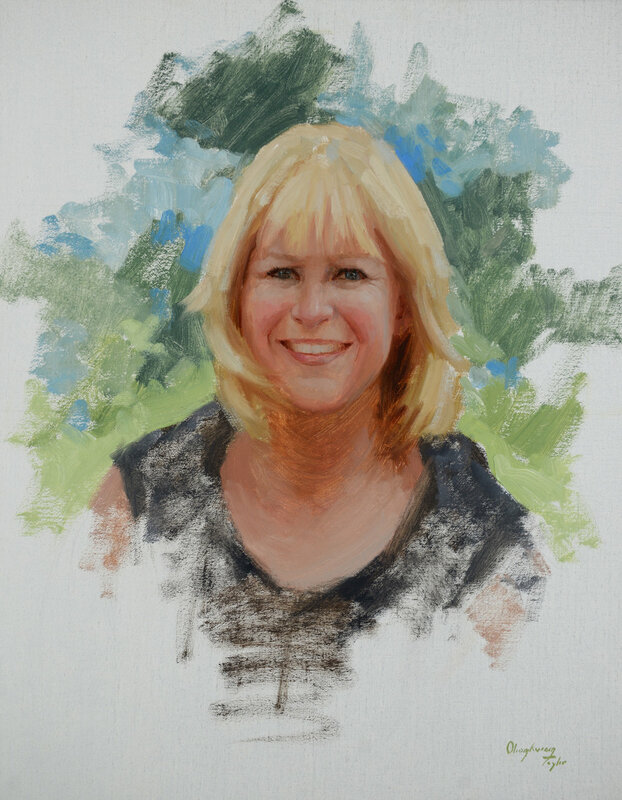 If possible, I will paint a 1-3 hour oil sketch of the model in order to capture the proper color and light for the final painting. If a live model session is not possible, I will then schedule a photo session with the model and explore several ideas and locations as well as spend some time with the model to get to know them and their personality. It is important to work from my own photo references as it allows me to be in your element--to experience the light and environment in order to capture the true feeling and character of the model. If necessary, I will work from your digital photos, but I must first approve them. I may ask for several photos or the retaking of photos in order to find one that I feel I can produce the best possible painting from. I will not be able to proceed with the commission if adequate photos are not available for me to work from. Your digital photos must be high quality, high res, large enough for me to work with. The best photos are with natural light from a cloudy day or only one light source in an indoor scene or light coming in from a window. Overhead indoor lighting is not the most flattering, so take the model to a north facing window to take your photo. If the photograph is outdoors there should be no speckled shadows or sun spots on the face but an even lighting with good shadows. DO NOT USE A FLASH! Once I either approve your photos or it is determined you can travel to my studio or I can travel to your location, a contract will be drawn up and signed. Please note this contract may be signed through one of my representing galleries. The client will pay 50% down and 50% upon completion of the commission. It will be determined whether or not the client would like to see a preliminary sketch and color study before I begin the final painting. Your commission will be completed between 3-4 months once the photo shoot has been taken or photos have been approved. Once complete, your painting will either be hand delivered or shipped depending on your location. Final Payment is due at this time.